Nicholas Nestorak is no stranger to traveling for the sake of opera. The tenor, who makes his Glimmerglass debut this summer as Monostatos in The Magic Flute, just wrapped up a season with Palm Beach Opera as Parpigonol in La bohème. Although he journeys from Florida this summer, Mr. Nestorak has been musically involved in his own locale for quite some time. 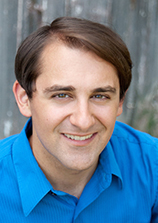 A native of Hillsdale, Michigan, Nestorak is a graduate of both Hillsdale High School and Hillsdale College, and recently earned his degree in Vocal Performance from University of Michigan. At the moment, it is Faust in Gounod’s Faust. I love the music in the entire opera, especially Faust’s aria and the final trio. Is your family involved in the arts as well and how? My older sister is: she runs a violin studio in our hometown and is one of the music directors at my church. My mother and father recently joined the church choir, but have always been music supporters for my sister and I. Are there any artists you feel particularly inspired by? I am inspired by my voice teacher, George Shirley. He had an amazing career and was such a hard worker. Hearing his stories during my years of study with him has inspired me to work hard, be prepared and do my best. What do you sing or listen to for fun? I love jazz, I used to play jazz keyboards for my high school band, and also picked up bass guitar. I’ll listen to pretty much anything except for rap. I really like cars and motorcycles. My father and I work on most of our vehicles at home. I also like to work out, specifically cycling. You can travel so far and see so much on a bike that you would miss when speeding by in a car. I probably would have been a cellist: I started my undergraduate degree with a Cello Performance and Chemistry major. I always thought I was going to play in orchestras someday, but I began studying voice and decided after getting my degree to pursue it for my graduate degree. Why are you most looking forward to at the 2015 Festival at Glimmerglass? I have heard so much about the high caliber of this festival and have spoken many times with friends who have performed in the Festival about the wonderful opportunities they were given and the talented artists that I will get to work with. It is so exciting to imagine how great this festival will be! Why are you excited about your role in The Magic Flute this summer? I am excited to be performing the role of Monostatos in the Magic Flute. I have performed the role of Tamino, but it is fun to see this opera from a different character’s eyes. It should be fun to team up with the Queen of the Night this time, and I am sure I will enjoy this great character tenor role!